Mentioned only 3 times in the entire Bible (Genesis 14:18-20, Hebrews, and Psalm 110), Melchizedek is a shadowy fellow we don’t know much about. He was a priest whom Abraham honored. That’s about all we know. So why does Melchizedek matter? Israel had three important leaders in ancient times: prophets, priests, and kings. In Israeli tradition, kings and priests had to come from different tribes: priests from the tribe of Levi and kings from the tribe of Judah. Ordinarily, a king could not be a priest. The Messiah would have to be a complete leader: priest, king, and prophet. But would that violate God’s law? NO! The perfect king would govern justly. The perfect prophet would reveal God’s truth. The perfect priest would bring God and the people together. Enter our Lord, Jesus Christ. He was the perfect Messiah. And Melchizedek establishes credibility for Jesus as both priest, king, and prophet. 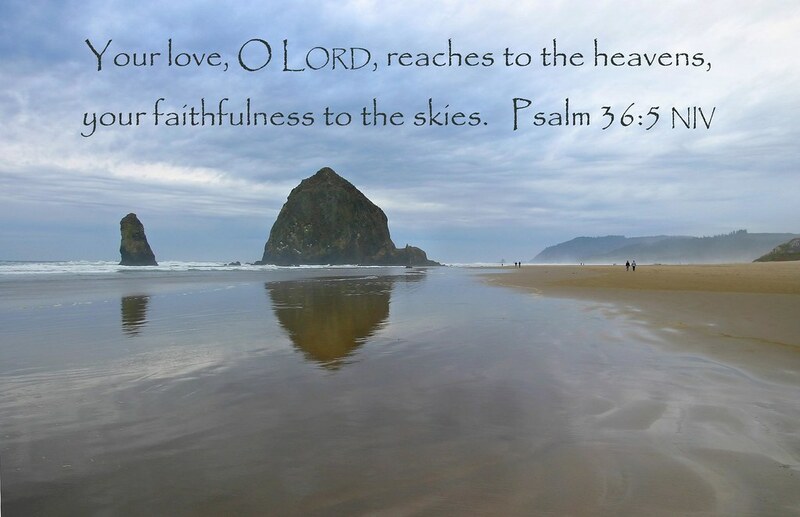 David praises the Lord for his faithfulness. David wants nothing. 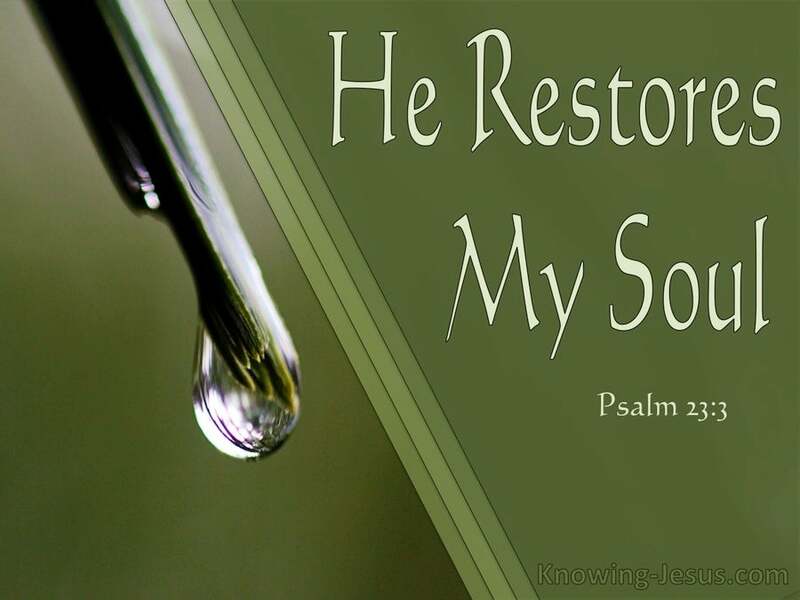 God restores his soul; God guides him; God takes away his fear; God comforts him; God gives him an abundant life. Goodness and love will follow him, and he will dwell with God forever. The wicked do not fear God. They do not know they sin. The plot evil, do wrong, and follow a sinful course. God’s love, faithfulness, righteousness, and justice is unfailing. Men find refuge in God’s wings. In God’s light we see His love. God overcomes all evildoers. 13) “He makes me lie down in green pastures, he leads me beside quiet waters, he restores my soul. He guides me…surely goodness and love will follow me all the days of my life.” All of these. Guiding my life. Restoring me when I’m empty inside. Granting me rest when I am weary. Leading me on the path of righteousness. Dwelling with him forever. Love is with me every day. 14) Personal Question. My answer: David about sums it up perfectly. Most unbelievers don’t know they sin and don’t care. They plot evil, have no moral compass, and don’t fear God. But God will overcome. Sin does breed sin and perpetuates and is ignored. 15) Personal Question. My answer: David knows God overcomes all and is in control. His love is bountiful, and He grants us abundance. We will have hardships, but He is our shepherd, guiding us to Him. It’s good to know God is in charge and to rely on Him completely when the hardships come. With arguably the most famous Psalm in the Bible as out study, BSF doesn’t dive into it enough. So much comfort, goodness, and wonder woven in Psalm 23. Please see End Notes for complete discussion of David’s heart and beauty in this amazing Psalm. This famous psalm has been the last words of thousands before they left this side of heaven. Where is the Lord a shepherd in the Bible? A shepherd to Moses, the Stone of Israel (Genesis 49:24). In Psalm 28:9 David invited the LORD to shepherd the people of Israel, and to bear them up forever. Psalm 80:1 the LORD as the Shepherd of Israel, who would lead Joseph like a flock. Ecclesiastes 12:11 speaks of the words of the wise, which are like well-driven nails, given by one Shepherd. Isaiah 40:11 tells us that the LORD will feed His flock like a shepherd; He will gather the lambs with His arm. Micah 7:14 invites the LORD to Shepherd Your people with Your staff… As in days of old. Zechariah 13:7 speaks of the Messiah as the Shepherd who will be struck, and the sheep scattered (quoted in Matthew 26:31). Ancient Middle Eastern cultures thought of their kings as shepherds as well. The idea of Jesus as the Good Shepherd was precious to early Christians. One of the more common motifs in catacomb paintings is Jesus as a shepherd with a lamb carried across His shoulders. The idea behind God’s role as shepherd is a loving care and concern. David found comfort and security in the thought that God cared for him like a shepherd cares for his sheep. David felt that he needed a shepherd. The heart of this Psalm doesn’t connect with the self-sufficient. But those who acutely sense their need – the poor in spirit Jesus described in the Sermon on the Mount (Matthew 5:3) – find great comfort in the idea that God can be a shepherd to them in a personal sense. “I decide to not desire more than what the LORD, my shepherd, gives. Sheep don’t always know what it needs and what is best for itself, and so needs the help from the shepherd. Sheep lie down (rest) only when it is without fear, friction, flies, and famine. The shepherd would guide the sheep to what he needed. David walks through the shadow of death; it is not his destination or dwelling place. In fact, it is only the Lord’s presence that makes this bearable. We face only the shadow of death because Jesus took death itself for us. Those facing death have been comforted, strengthened, and warmed by the thought that the LORD will shepherd them through the valley of the shadow of death. Evil still lurks, but we do not fear it for the shepherd is with us. It is at this moment that the “He” of Psalm 23:1-3 changes to “You.” The LORD as Shepherd is now in the first person. The rod and the staff were instruments used by a shepherd. The idea is a sturdy walking stick, which was used to gently guide the sheep and to protect them from potential predators. There is some debate among commentators as to if David had the idea of two separate instruments (the rod and the staff), or one instrument used two ways. The Hebrew word for rod (shaybet) here seems to simply mean “a stick” with a variety of applications. The Hebrew word for staff (mishaynaw) seems to speak of “a support” in the sense of a walking stick. Either way you look at it, the rod and staff was a comfort to David, knowing God guided him and corrected him. In the Old Testament world, to eat and drink at someone’s table created a bond of mutual loyalty, and could be the culminated token of a covenant. An oracle of transgression could mean David were divinely taught by the sins of others or it’s the voice within a sinner. We see “oracle of the Lord” in Genesis 22:16 and “oracle of David” in 2 Samuel 23:11. It is likely that Paul had this Psalm in mind as he composed the opening chapters of his great letter since he quotes verse 1 in Romans 3:18. The wicked thinks of himself much more highly than he should both in regard to his sins (his iniquity) and his prejudices (hates). Flattery can be us thinking we are more than we actually are; it doesn’t have to come from others. How does one flatter himself with regards to sin? Sin is found in what we don’t do as well as in what we do. The translation of mercy here is inconsistent for the same Hebrew word hesed is translated as loving kindness is both Psalm 36:7 and 36:10. This wonderful word speaks of God’s love and mercy, but especially to His covenant people. David can only describe these attributes of God with the biggest things he can think of – the heavens, the clouds that fill the sky, the great mountains, and the great deep of the sea. What does shadow of Your wings mean? The wings of the cherubim that are over the throne of God and represented in His tabernacle and temple, including the ark of the covenant, the very representation of His throne. Like a mother hen covering her young chicks under her wings to protect, hide, and shelter them. We saw this in Ruth with Boaz (Ruth 2:12), and when Jesus was speaking of Jerusalem (Matthew 23:37). I’m inclined to think both. The fullness (abundance) of your house is will one of our great joys in heaven when we come to our Father’s house. With unmeasured satisfaction we will have the right to roam heaven and say, “Is this ours? And is this ours?” and say it unto eternity. What does “in your light we see light” mean? We see light twice: light discovering and light being discovered and enjoyed. Light is invisible by itself. Everything is invisible until light strikes it. So it is with God: we can’t see Him, but “in his light” (under his loving influence), we see and understand His love in all that surrounds us. God’s overwhelming generosity stands in complete contrast to the self-important plotting of wicked humans. “The Hebrew is, draw forth, or draw out thy lovingkindness: a metaphor either taken from vessels of wine, which being set abroach once, yield not only one cup, but many cups; so when God setteth abroach the wine of his mercy, he will not fill your cup once, but twice and seven times” (Greenhill, cited in Spurgeon). Unlike the righteous who may fall seven times yet rise up again (Proverbs 24:16), the workers of iniquity remain in the dust as God protects His servants. THERE: Some scholars think it refers to the pride mentioned in the previous verse, others to the place where the workers of iniquity practiced their sin. David leaves Samuel at Naioth and goes to Ramah to see Jonathan. David asks Jonathan why his father is trying to kill him. Jonathan didn’t know his father was trying to kill David again and offers his help. David devises a test to see if Saul still wants to kill him or not: Jonathan is to go to a dinner David is supposed to show up to during the New Moon festival. If Saul loses his temper when he finds out David has fled, then it is not safe to return. If Saul is indifferent, then it is safe to return. David makes Jonathan re-swear his oath because he is afraid Jonathan will lead him into a trap and tell him the wrong thing. Jonathan will go to David’s hiding place and shoot 3 arrows. He will tell his boy to say different things, one meaning it is safe, one meaning David must flee. When David doesn’t appear at the festival, Saul gets angry and accuses Jonathan of siding with David over him. Saul was so angry he hurled his spear at Jonathan to try and kill him as well. Jonathan then went to where David was hiding and gave the signal for him to flee. They wept and kissed and David fled, while Jonathan returned to the town. 10) Jonathan has a great heart who believes the best in people. He puts his own life at risk to save his best friend, David. He doesn’t believe his father is capable of hurting David, even though he’s seen his father throw a spear at David. He thinks he can convince his father he’s wrong. Jonathan trusts in the Lord as shown when he single-handedly took on the Philistines. I like how he does believe the best in people, even when it’s obvious they are evil inside. 11) Jonathan knows right from wrong. He knows David is innocent and had done nothing to deserve death, yet Saul is bent on it. It angers Jonathan (1 Samuel 20:34), and he’s ashamed of how his father is acting. His own father even hurled his spear at him to try to kill him (1 Samuel 20:33). Jonathan seems to understand that David is the chosen king. He sees this in all the blessings God has heaped upon him in his victories against the Philistines and protections from Saul. He also understands David is doing God’s will; whereas, his own father is not. As we’ll see, Jonathan knows David will be king, and he’s fine with being number 2 (1 Samuel 23:17). 12) Personal Question. My answer: True friendship is sacrificial. When you’re willing to sacrifice for the other person (time, help, money, etc), then you are true friends. And you stand with the friend who does right, not wrong. They loved each other deeply and were willing to do anything for the other — even risk their own life. This is true friendship. We see God at work in friendships as well and what a true friendship looks like. This is important in this day and age when people have thousands of “friends” on social media — relationships that aren’t real. Sacrificial love these days are rare and pretty much exclusive to immediate family members. This is definitely inspiring! Here, we see a heart-to-heart with best friends. We just saw the Spirit of God protect David in Naioth. David could have simply stayed there for however long it took Saul to give up or die. However, David needed to know if there was still a chance to reconcile with Saul. David needed to know where Jonathan stood. Jonathan reassured David of his love, telling him he had no idea of the attempted arrest. He warned him of Saul’s intentions. David is discouraged, but Jonathan reassures him — the hallmark of a true friendship. David comes up with a test to see where Saul’s heart lies. At a feast, David asks Jonathan to observe his father’s reaction, which will tell where Saul’s heart is. Since Jonathan is next in line for the throne and Saul’s son, David is unsure. Jonathan, however, is not. In those days when one royal house replaced another, it was common for the new royal house to kill all the potential rulers from the old royal house. Jonathan knew that one day David and his descendants would rule over Israel, and he wanted a promise that David and his descendants will not kill his descendants. Jonathan and David agreed to care for one another. Jonathan agreed to care for David in the face of Saul’s threat, and David agreed to care for Jonathan and his family in the future. David fulfilled this promise to Jonathan (2 Samuel 9:1-8 and 21:7). Jonathan would use arrows as a sign of Saul’s heart. 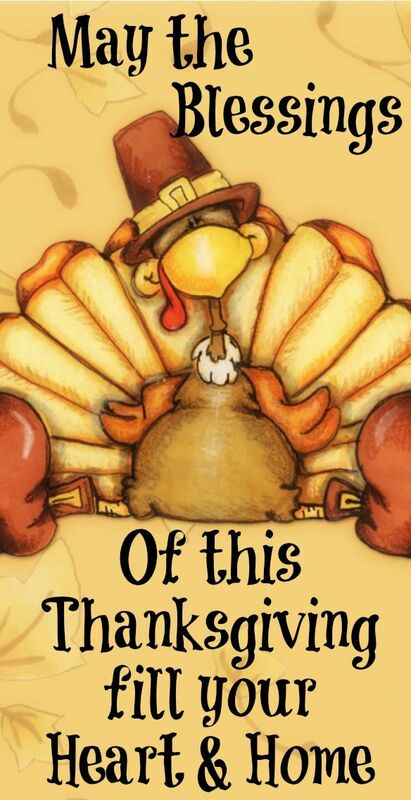 Ceremonial uncleanliness might cause a person to miss a feast such as this, but ceremonial uncleanliness only lasted a day (Leviticus 22:3-7). So when David’s place was empty the next day, Saul demanded an explanation. Speaking of David derisively as ‘the son of Jesse,’ accentuated his lowly birth and place in the royal family. Jonathan covered for David, trying to give Saul a plausible (and truthful) explanation for David’s absence. Jonathan knew what was right before the Lord — and this wasn’t right. A lifetime is nothing but small moments. One small moment can change your life forever. The weeping is because both men knew they might never see each other again. In fact, Jonathan only sees David once more shortly before he is killed. A sad part of life sometimes how we don’t see loved ones again. Why does God put David on such a path in life? Since the plan with the Philistines didn’t work, Saul would take matters into his own hands and call for David’s death. He asked his son and attendants to kill David. Jonathan warned David his life was in danger and told him to go into hiding. Jonathan reasons with his father, Saul, who took an oath not to put David to death. David and Saul’s relationship is mended. Once again, the Philistines attack, and David defeated them again. Saul once again threw his spear at David. This time, David flees after his wife warns him, and she puts an idol (why does she even have one?) in the bed to be David. When Saul confronts her as to her role in David’s escape, she claims David threatened her life. David flees to Samuel’s home of Ramah for protection. Saul sends men after David, but God protects David and makes the men prophesy. Eventually, Saul goes to Ramah himself to get David, and God makes him prophesy as well. David prays to God to protect him from his enemies (in this case, Saul). He’s done no wrong, yet he is attacked. David knows God will go before him and take care of his enemies for His glory. 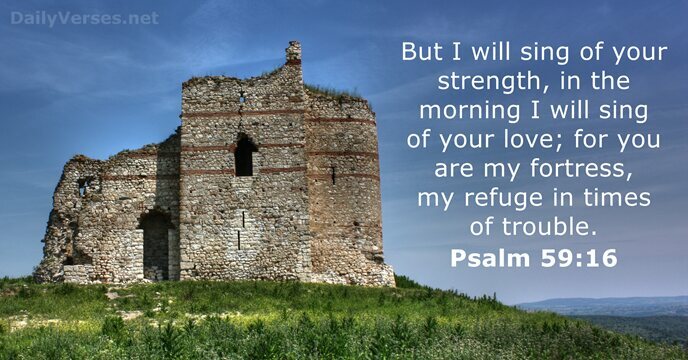 David will praise God always for He is his fortress and refuge. 6) They risked everything, even death, to save David, since Saul has been prodded by an evil spirit who will kill at a moment’s notice. 7) Personal Question. My answer: Every day in small sacrifices that could cause me harm or risk my job or relationships, such as standing up for what I believe, calling people out when they twist God’s words or writing what I believe. 8 ) Personal Question. My answer: David’s faith is unshakable. He knows God will take care of him and his enemies and do it all for His glory. He knows God will answer his prayers. He knows he is in God’s hands. David’s faith gives him the strength and courage to go on, fighting for God, when all he probably wants to do is flee and go live a cushy life somewhere. 9) Remembering God and who He is and what He is capable of strengthens us as well as we are facing our own enemies in this world. It will give us the courage to fight another day and strengthen our faith as we allow God to be in charge and lead us in His ways. We walk differently and act differently when we don’t worry, knowing God is in control. I like reading David’s thoughts and prayers along with the action of the Old Testament. It’s like a movie or book, having inside knowledge of what the character is thinking. It puts a personal touch to all the battles and jealousy and hiding. David’s life shows us what a life full of hardships looks like and how it can be used by God for good. Very encouraging. Saul put everyone in a difficult spot, forcing them to choose obedience to a king or obedience to THE KING. Jonathan loved David, and God made a wonderful bond of friendship between them, sealed by a covenant (1 Samuel 18:1-4). Jonathan knew David was destined to be the next king of Israel, even though Jonathan was officially the crown prince. At the same time, his father and king told him to kill David. The servants all loved David (1 Samuel 18:5) yet they are commanded by their king to kill David. Sin is never excused, even when ordered by a higher authority. We are under authority and commanded to submit to God’s order of authority in many different arenas. There is a Biblical submission from children to their parents, from citizens to their government, from employees to their employers, from Christians to their church leadership, and from wives to their husbands. But in all these relationships, we are never excused from sin because we obeyed an authority that told us to sin. In this case, it would be wrong for Jonathan to obey his father and kill David. Jonathan stood for what was right AND took action to prevent a wrong by warning David. He did not stand idly by and allow a sin to take place. Putting his own life on the line, Jonathan defended David to his father AND told his father his jealousy is a sin. Saul’s mind had twisted all the facts from the past and had put David as being selfish about killing Goliath and doing everything for fame instead of for the Lord. Jonathan tells him how it is — something we all need in our lives. God used Jonathan, but it wasn’t the work of Jonathan. It was the work of the LORD, and Saul recognized this by declaring this oath. Why did Saul break his oath to not kill David? Saul was in a spiritual battle — a battle he was unprepared for. 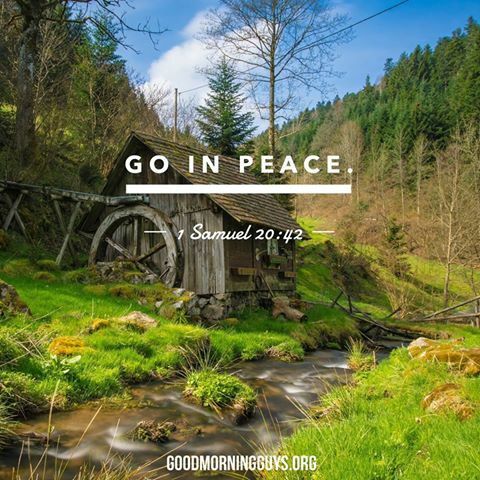 At the end of 1 Samuel 19:7 there was a truce in the spiritual war involving David and Saul. But whenever we are at a time of cease-fire in the spiritual war, we know the battle will begin again before long. Saul was unprepared to handle temptation, unprepared to handle spiritual attack, and had the opportunity to sin close at hand. Most of us will trip up under those circumstances. Fun Fact: David never returns to the palace until he is the king of Israel – some 20 years later. From now until the day Saul dies, David lives as a fugitive. For the second time, Saul breaks his oath (1 Samuel 19:6). not to kill David and sends men after him. Michal acts according to the principle of Genesis 2:24: Therefore a man shall leave his father and mother and be joined to his wife, and they shall become one flesh. The former family loyalties and obligations take a back seat to the loyalty and obligation to the new family. During this night, when men watched his house and David escaped, he composed a song unto the LORD found in Psalm 59. David sings in times of trouble. Why does Michal have an idol? The idol was a teraphim, a figurine used as a household idol or as a fertility and good luck charm. In ancient Israel, teraphim were intended as aids in worshipping the true God. The Israelites didn’t think of the teraphim as other gods, but as representing the God of Israel — which Exodus expressly forbids. The teraphim shows the slow deterioration of Israel even during these good times. The idol shows that Michal didn’t have the kind of relationship with God she should have. 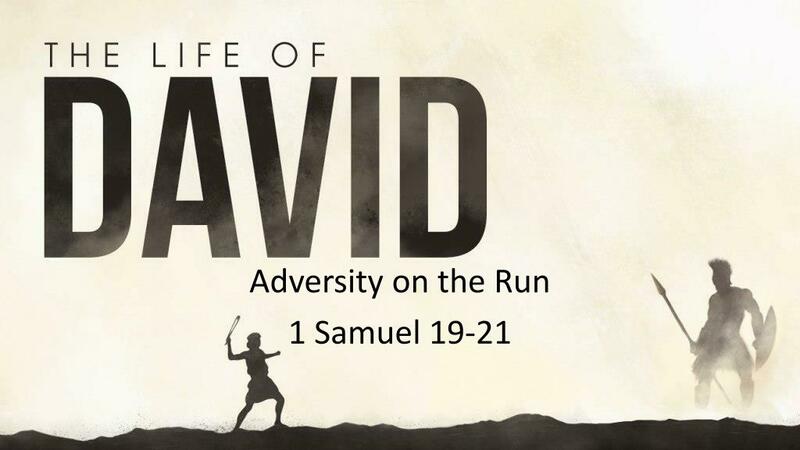 This weak relationship with God will reveal itself in Michal as the story of David’s life unfolds (2 Samuel 6:16-23). Saul calls David his enemy. These are the saddest words in this passage. You can imagine David’s confusion. So what does he do? Flees to safety, reassurance, and support — Samuel. The word Naioth comes from the Hebrew word for residence. This spoke of Samuel’s home (which may have had “Naioth” title itself), or it may have been some landmark or specific place in Ramah. Whenever Naioth is mentioned, it is associated with Ramah. Why are the Israelites prophesying? Prophesying doesn’t necessarily mean the Israelites are all seeing the future. The Hebrew word simply has the idea of speaking under the inspiration of the Holy Spirit. They probably all gave spontaneous and inspired praise to God. This was God’s way of protecting David. This was an unusual work of the Holy Spirit – to come upon men who did not seek after God, who did not long to be filled with the Spirit prophesying. This kept happening. Saul didn’t get the message. Why did Saul take off his robes? Saul would not humble himself before God, and so God will find a way to humble him. It is unlikely – though possible – that Saul stripped himself bare. The Hebrew word for naked can indicate just stripping down to the undergarments. Saul probably took off all the royal robes that said “prestige” and “royalty,” and laid himself out bare before the LORD in his plain linen undergarments, stripped of all his royalty and glory. A person can be affected by the power of God (resulting in amazing experiences), but not surrendered to the power of God, which results in a changed life. This was Saul. Saul is among the prophets appeared in 1 Samuel 10:10-12, and it expressed astonishment that someone became a religious enthusiast. This Psalm is about 1 Samuel 19:11-12, which was when the murderous intent of King Saul against David was openly revealed, and David began his time living as a fugitive and in hiding. David faced many perils and enemies and many of his Psalms begin with this thought. This is common and to be expected when you lead a Godly-life. The man after God’s heart, Israel’s greatest earthly king, had many enemies — as did the Son of David. Defend me is an ancient Hebrew word, meaning to lift up, as into a safe and defended place. It says, “Lift me up to Your high tower where I am even higher above those who rise up against me.” This idea is repeated three more times in the Psalm (59:9, 16, 17). The word protect (defend 59:1) like the kindred word ‘fortress’ (defense) (59:9, 16, 17), contains the thought of what is set high up, out of reach. Like the best movies of today, David was the target of a focused assassination plot that came from the highest levels of Israel’s government. Many felt they could advance their favor before King Saul by killing David. Knowing the danger, David looked to God for rescue and defense. David looked to God for help. He didn’t make a claim to sinless perfection. He simply told God there was no justified reason for Saul to send bloodthirsty assassins against him. The men sent to watch David’s house and kill him were determined. They didn’t give up quickly, and they growled like dangerous dogs. The word belch: ‘Belch’ means to gush out, and is found in a good sense in Psalms 19:1. Here it may perhaps be taken as meaning ‘foam,’. The root idea is of bubbling up and bursting out; so in terms of dogs, ‘See how they slaver at the mouth’. All who opposed God would be held in derision. The word defense has the idea of a high tower or fortress. David believed that God was like a strong, high tower for him. It seemed impossible for David to survive against such a powerful conspiracy against him, but God would be his defense, his high tower. This verse reminds me of the song Strong Tower by Kutless. My God of mercy. David knew that God would be merciful to him and that God would meet him, even lead him, in his need. David didn’t only want the defeat of his enemies. He wanted them defeated in a way that would do the most good for God’s people. If those enemies were kept alive but scattered, the lesson would last longer. Whenever David prayed for the destruction of his enemies (and sometimes he prayed quite severely), he had in mind not only his personal deliverance, but also what the display of Divine justice would teach God’s people. David repeated the prayer consume them twice for emphasis. Let them know that God rules in Jacob to the ends of the earth: These words are very similar to what David said to Goliath in 1 Samuel 17:46. The line from Psalm 59:6 is repeated for emphasis. Wandering the streets is like hungry dogs do, looking for food. David’s heart was filled with songs of praise instead of dark fears. He started the Psalm asking God for His defense (Psalm 59:1); at the end of the Psalm, he was so confident in God that he could sing about it. For the next perhaps 10 to 15 years (and the rest of the book of 1 Samuel), David had to live as a fugitive, constantly in danger of his life. It’s interesting to note that David entered the period singing praises and was still singing praises at the end of his fugitive years (2 Samuel 1:17-27). After David killed Goliath, he was not allowed to return home. Jonathan, Saul’s son, became best friends with David and made a covenant with David. David rose quickly in the army ranks. After the Philistines were defeated, the army returned home. The women of the towns ran out to greet the army and sang how David killed more men than Saul. This angered Saul, and he became jealous. An evil spirit from God came upon Saul, which caused him to hurl a spear twice at David, who eluded it. Saul feared David because the Lord was with David and not him. Saul sent David away to fight his battles, which he did successfully since God was with him, winning the hearts of the people. In everything David did, he had great success. David turned down the marriage of Saul’s oldest daughter, Merab, but gathered 200 foreskins from the Philistines as a bride price for Saul’s second daughter, Michal, who loved David. Saul kept sending David out to battles, hoping the Philistines would kill him. Instead, David had success after success, making his name well-known with the Israelites. 3) Saul is very human; he is jealous of David because of his success and popularity with the people. This would be most people’s reaction. He’s feeling insecure as it is, knowing God is not with him, and he’s not the chosen king of Israel. Jonathan and David are fast friends. They probably shared a lot in common, both being close to the King and having high expectations put upon themselves. They are the epitome of best friends. Michal loved David and presumably he loved her since he did as Saul asked him to do (fulfilled the bride price of 100 Philistine foreskins) for her hand in marriage. All David’s relationships mirror ours: messy. It’s a ubiquitous human condition, and it’s comforting to know my personal life isn’t as bad as I thought! 4) Personal Question. My answer: Saul is jealous of David. This is a lesson we all need to be better at and improve in our lives since it is usually the first reaction we have to others who get something we want like a promotion or beautiful kids. Then Saul tries to trap David, which backfires miserably. We should not try to do this to others, although it can be tempting to do. No one said following Jesus and being like him was easy. 5) Part personal Question. My answer: All that David does (battles to marrying the King’s daughter) is blessed by God. Yet, that puts a target on his back as people are jealous of him, and when people are jealous, most will stop at nothing to bring that person down. As we’ll see, David has to go into hiding because Saul is out to kill him. I am thoroughly blessed in my life, living for something greater than myself and my own needs. That being said, doing what Jesus would do is a daily challenge in my interactions with my work colleagues, others, and my family. Overcoming my innate selfishness to put others first is challenging and fighting all the temptations the devil throws at me is exhausting. Still, all is for Him, and I’d want it no other way. Good lesson on the price of being a Christ-follower: blessings and costs involved. You will be enriched beyond imaging, but it won’t be easy with sacrifices along the way. Also, we see David as human with the same struggles we all have, which helps us to not try to be so perfect in all that we do. We met Jonathan in 1 Samuel 14 where he attacked the Philistines single-handedly. How are Jonathan and David alike? How were Jonathan and David different? Jonathan was the first-born son of a king (1 Chronicles 9:39), while David was the last-born son of a farmer. This made Jonathan more than a prince, he was the crown prince. By everyone’s expectation Jonathan would be the next king of Israel. Jonathan understandably should have been the one jealous of David since David was the biggest threat to taking the throne. Instead, their friendship was stronger than jealousy, envy, and ambition. They loved each other more than the throne of Israel because they loved God more than the throne of Israel. David would never again be a shepherd — but he’d always have the heart of a shepherd. How were Jonathan and David submitted to the Lord? Jonathan gave David the robe and his armor, the action in effect recognizing God’s choice of the next king. Because Jonathan was surrendered to God he could see the hand of the LORD upon David. He knew David’s destiny and was perfectly willing to set aside his ambition to honor the LORD’s choice. David, who had already been anointed as king by Samuel (1 Samuel 16:13), would wait 20 years before he’d be king. David was willing to let God put him on the throne, and to do it in God’s timing. Why was David well-known and popular amongst the Israelites? David became popular because he was a man after God’s own heart and people could see the love, wisdom, and peace of God in him. David was now a general in the Israeli army and worked hard to please Saul. David did not let his popularity go to his head. As a shepherd, David put God first. He lived a simple life, which God had prepared for him. He was humble. What fueled Saul’s jealousy of David? Since Saul did not have God’s heart, all he had was man’s praise. When David was praised more, Saul became jealous. It’s the sign of a bad leader when you’re threatened by a subordinate. Saul has a guilty conscience. He knows he’s not God’s chosen leader of Israel any more, but he won’t step down. This evil spirit was first mentioned in 1 Samuel 16:14. It came upon Saul, permitted by the LORD, when the Spirit of the LORD departed from Saul (1 Samuel 16:14). David was brought into Saul’s royal court to play music, so that Saul would be ministered to and soothed when suffering from this spirit. Prophesy is a poor translation here from the Hebrew. It more means idle ravings. Saul was babbling and not in his right mind. Most men would think playing music was beneath them once they had garnered the kind of success David had. Not David. Moved by the spirit, Saul chooses to throw a spear at David with the intent to kill. David could have retaliated with no personal repercussions; but, he didn’t. Saul’s life is in God’s hands. Twice! The throwing of the spear proved God was with David. Saul became afraid and wanted David dead. Saul promotes David in the army with the intent David will die in battle. Saul had promised to give… his daughter to the man who killed Goliath (1 Samuel 17:25). Now, Saul makes good on the promise, offering his older daughter, Merab, to David. Saul concocts a plan to get rid of David, using his daughters. In ancient times, a dowry was required whenever a man married. The dowry was paid to the bride’s father, and the more important and prestigious the bride and her family, the higher the dowry price. Since David was from a humble family, there was no way he could pay the dowry for the daughter of a king. Saul knew this and will demand that David kill 100 Philistines as a dowry. Saul figured that the job was too big and too dangerous for David, and he would be killed gaining the dowry to marry a king’s daughter. Saul is a clever manipulator. He takes advantage of David’s loyalty, patriotism, courage, and heart for the LORD. Yet David, whose name is being sung all over Israel, is humble and refuses the marriage proposition. Saul tried to make David jealous by giving his daughter to another man. Didn’t work. Michal will be a snare to David as we shall see in (2 Samuel 6:16-23). Why ask for 100 foreskins? The dowry price was designed to goad David on (“Go get those uncircumcised Philistines”). The dowry price was designed to be difficult because the Philistines would obviously have to be dead. The dowry price was designed to make the Philistines completely outraged at David, because from their perspective, not only were their men killed, but also their dead bodies were desecrated. The foreskins proved they were from unbelievers (the Philistines) since the Israelites were all circumcised. David, who had already qualified for the marriage with the death of Goliath, humbly agrees. He suspects nothing. David brings back more just to solidify the bargain. Did Saul’s plan against David work? In Saul’s mind, yes. The Philistines went out to war against David in retaliation for what they felt was a terrible disgrace against the Philistine people. Saul wanted to make David a marked man, and he succeeded. In reality, Saul’s plan backfired. David is not only alive, but he’s also more popular and closer to the LORD than ever. Saul isn’t finished, and will use more manipulation, cunning, and outright violence to attack David. However, David’s wise behavior and high esteem were both closely connected to his humble heart. Here, we see Jesus, the Son of David. Philippians 2:9 says of Jesus, Therefore God also has highly exalted Him and given Him the name which is above every name.